Devotee (reading): "We prepare our next life by our actual activities in this present life. A living entity is offered a particular type of body as a result of his action in the present body." Prabhupāda: Yes. Karmaṇā daiva-netreṇa jantor deha upapattaye (SB 3.31.1). Our next life means according to the karma, activities, in this life. They're judged at the point of death. The..., our activities are judged, and then we are given opportunity by the laws of nature to be carried in another mother's womb to get another gross body. We have got two kinds of bodies: the gross body and the subtle body. When this gross body is stopped working, the subtle body works. We have got experience every night. When you are lying down on bed, you are dreaming. You have gone somewhere else from your room and you are acting. That means the subtle body is acting. Similarly, when this body's stopped, nobody works, no more working, or the machine is broken, then, at that time, the subtle body carries you to another machine. This body is machine. Yantrārūḍhāni māyayā (BG 18.61). This is stated in the Bhagavad-gītā. This is yantra. So just like your car, you are driving one car, the car is stopped for some reason; it is no more working. Then what do you do? You get down. You get another car. Similarly, when this body's not working, then you give up this body; you take another body. Now, taking another car means as you are paying for it. If you are paying very lump sum, you can (get) a better car. But if you cannot pay, then you have to accept a low-grade car. Similarly, the price means according to your karma, you are offered a car. Prakṛteḥ kriyamāṇāni guṇaiḥ karmāṇi sarvaśaḥ (BG 3.27). Prakṛti. Māyā creates a car for you, a carrying conveyance, this body. So that conveyance is according to karma. So if you act piously in this life, then next life you get good body. Ūrdhvaṁ gacchanti sattva-sthā (BG 14.18). Sattva-sthā. If you are in goodness, then, in the modes of goodness, then you are promoted to higher standard of life. Ūrdhvaṁ gacchanti sattva-sthā madhye tiṣṭhanti rājasāḥ. And if you are in passion, then you remain here. And adho gacchanti tāmasāḥ. And if you are ignorant, then you go to animal life or lower grade of life. This is the law of karma. ...understand Kṛṣṇa. You can understand Kṛṣṇa simply by chanting Hare Kṛṣṇa mantra. Sevonmukhe hi jihvādau (Brs. 1.2.234): simply by your service attitude, to serve Kṛṣṇa, beginning with the tongue. It is very wonderful. But utilizing your tongue, you can achieve Kṛṣṇa very easily, by the tongue. By the tongue if you simply chant, without any offense, Hare Kṛṣṇa mantra, and by the tongue if you simply taste Kṛṣṇa prasādam, and by the tongue if you speak about Kṛṣṇa, yāre dekha tāre kaha kṛṣṇa upadeśa (CC Madhya 7.128), you understand Kṛṣṇa. The three business of the tongue: tasting the prasādam, chanting Hare Kṛṣṇa mantra and preaching about Kṛṣṇa. By these three things you understand Kṛṣṇa, and as you understand Kṛṣṇa, tyaktvā dehaṁ punar janma naiti mām eti (BG 4.9), you are transferred to the spiritual kingdom. * Above painting from Bhagavad-gita As It Is: On the left, a boy is dancing before the Deities of Radha-Krishna. The result of such devotional consciousness is shown on the right, where he is dancing with Krishna in the Lord's spiritual abode. Second section: On the left a man is offering charity to a brahmana; on the right he has taken the body of a demigod and is enjoying heavenly delights. 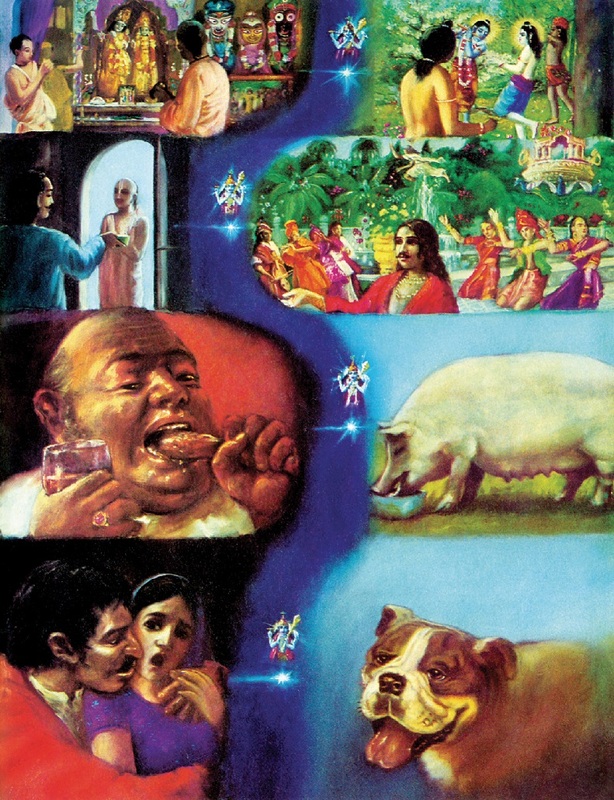 Third section: A man is eating meat and other abominable foods; in his next life he is seen in the body of a hog who eats anything and everything. Bottom section: On the left a man is too consumed with lust; in his next life he takes the body of a dog.